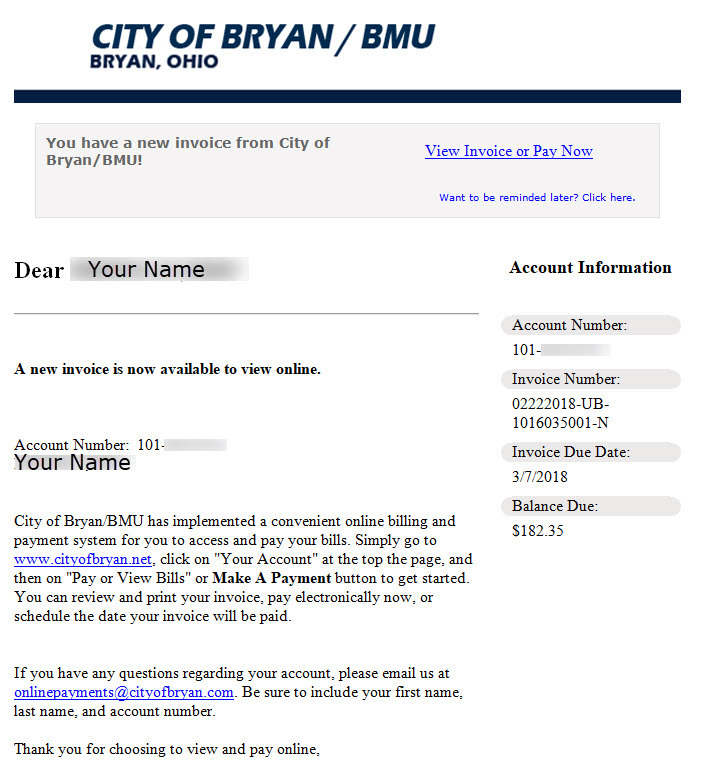 The City of Bryan offers several ways to make bill paying more convenient. Standard billing – With standard billing, you receive a statement once a month showing the charges on your account. Simply place your payment in the envelope included with your bill and mail it by the due date. Automatic payment – Payment can be made by automatic debit from your checking or savings account. You will still receive a statement showing your charges, and the amount due will be deducted from your account on the date due. 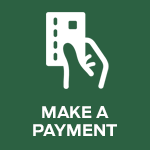 Automatic payment is easy to set up, just fill out the Automatic Payment Form and return to the City Clerks office. No due dates to remember, and you will never have to worry about paying your bill again. Please link to Automatic Payments to learn more. In person – You can pay your utility bill by visiting the City Clerk-Treasurer’s office located in the Don North Municipal Building, located at 1399 East High Street. Our office business hours are 8:30 a.m. to 4:30 p.m., Monday through Friday. Payment can be made with checks, cash or credit card. Drop off – Payment can be dropped off any time in the box near the north door of the Don North Municipal Building located at 1399 East High Street or in the drive-up box located in parking lot. Pay by phone – Payment can be made by phone by calling 855-985-1097, 24 hours a day, seven days a week. A service fee of $4.90 will be applied to all credit card and e-check transactions made for utility payments and utility deposits. You must have your account number to make the transaction. Online payment – Utility customers now have the option of paying their utility bills with a credit card securely over the Internet. This is a safe and very convenient way to pay. Additionally, customers may select to have their utility bills emailed to them instead of having them mailed to their address. The online payment option allows you to review your current utility bill and make payments 24 hours a day, 7 days a week. We are pleased to provide this service to our customers. Just click on the Online Payments link to get started. You will need your utility account number and a valid email address to get set up. Discover, Mastercard and Visa are accepted. This is a fee-based service. A service fee of $3.95 will be applied to all credit card and e-check transactions made for utility payments and utility deposits. There is a maximum payment amount of $400 for credit card payments and a maximum payment amount of $125,000 for e-check utility payments and utility deposits. Please contact the Clerk-Treasurer’s office at 419-633-6020 or email at onlinepayments@cityofbryan.com if you have any questions. Sample e-mailed bill from BMU. BMU has implemented a program called the Bryan Good Neighbors Utilities Fund to help households with their basic water and electric bills. The program provides emergency bill paying assistance to BMU customers who cannot make their payment and are in danger of having their electricity and/or water shut off. Click here for more information about the Bryan Good Neighbors Utilities Fund.